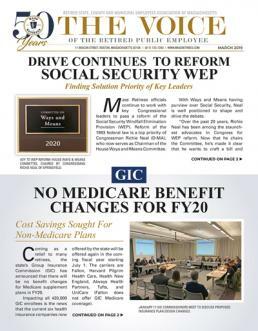 JANUARY 2011 VOICE: The shift in power in the US House of Representatives could prove to be a mixed bag for those hoping for swift action on the Social Security Windfall (WEP) and Offset (GPO) reform bills. JULY 2009: As talk of reforming America’s retirement safety net continues to grow, Association officials have stepped up efforts to build a strong and broad national coalition of organizations to support a repeal of both the Social Security Windfall Elimination Provision (WEP) and Government Pension Offset (GPO). NOVEMBER 2007: Kerry Supports Social Security Hearing. In politics, it is often said that the squeaky wheel gets the grease. On the issue of Senate hearings on the repeal of the Social Security Windfall Elimination Provision (WEP) and the Government Pension Offset (GPO), the voice of Association members has been heard loud and clear. Sept 2007 - Waits for Overhaul - Although Senator John Kerry co-sponsored bills that would permanently repeal both the WEP and GPO, which we reported in the July issue of the Voice, it now appears that the Senator would rather address the legislation within the context of an overhaul to the Social Security System. also oppose these two laws. 2007 MAR - New Social Security Chairman Named - Members, affected by Social Security’s WEP (Windfall Elimination Provision) or GPO (Government Pension Offset), will be pleased to hear that bills to repeal both laws have not only been refiled in the Congress, but have already received overwhelming support. On the first day of the current (110th) session, California Congressmen, Democrat Howard Berman and Republican Howard “Buck” McKeon, filed the bipartisan House bill (H.R. 82) to repeal the WEP/GPO outright. JAN 2007 - Like many members, retired Marshfield teacher Edris Kelley had held out hope that change would come to the power structure in Washington, D.C., sooner rather than later. While the life-long Democrat longed for political change, it was not based entirely on partisan principles alone. who have been impacted by the Windfall Elimination Provision (WEP) and Government Pension Offset (GPO), have grown increasingly frustrated by the lack of progress on Capitol Hill with legislation to provide relief from the two devastating laws. continuing the effort exclusively with the Congress. JULY 06 - Social Security Justifies Laws - Association officials, along with representatives from other non Social Security states, strongly took issue with the remarks of a Social Security Administration official, which seemed to justify the existence of the Government Pension Offset (GPO) and Windfall Elimination Provision (WEP) laws.